A delicate looking creeper, Pink Chintz Thyme has small fuzzy gray green leaves set close together on the stem. This makes it ideal for smaller spaces like those between stepping stones or flagstones. Pink Chintz blooms very early in spring. 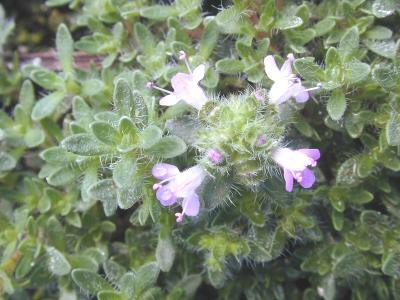 Four to six weeks later, when it is finished blooming, Mint Thyme starts blooming and when Mint Thyme is finished, Annie Hall Thyme is full bloom. This is usually around July here. By planting all three in large blocks or separate areas, we have thyme blooming from March to August. This will vary depending on when your spring starts. One of our customers has used Pink Chintz Thyme to create this lovely patchwork flagstone patio. Many thanks to artist David Saccheri for sharing this photo with us. Pink Chintz Thyme is one of the small-leaved thymes that we recommend for tight spaces. The others are Annie Hall Thyme, Elfin Thyme, Highland Cream Thyme, Leprechaun Thyme, Mint Thyme, White Moss Thyme and Woolly Thyme. 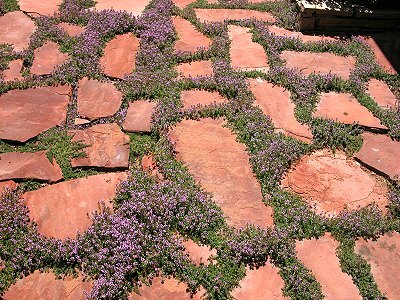 Pink Chintz Thyme is often included in our economical Flagstone Filler Assortment. This plant is often available in plug trays. These trays hold 128 of all the same plant. They are a great low cost way to fill a lot of space. Each cell is 3/4 of inch by an inch. Check here to see if Pink Chintz Thyme Plug Trays are available.